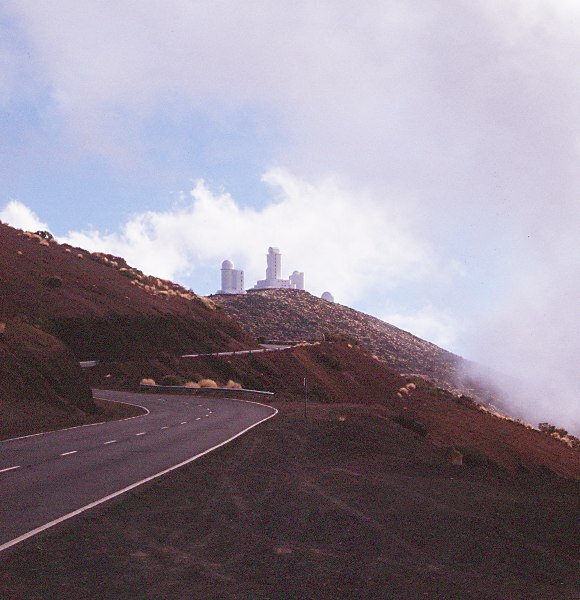 This page contains photos taken at Tenerife's Teide Observatory (Observatorio del Teide (OT)). 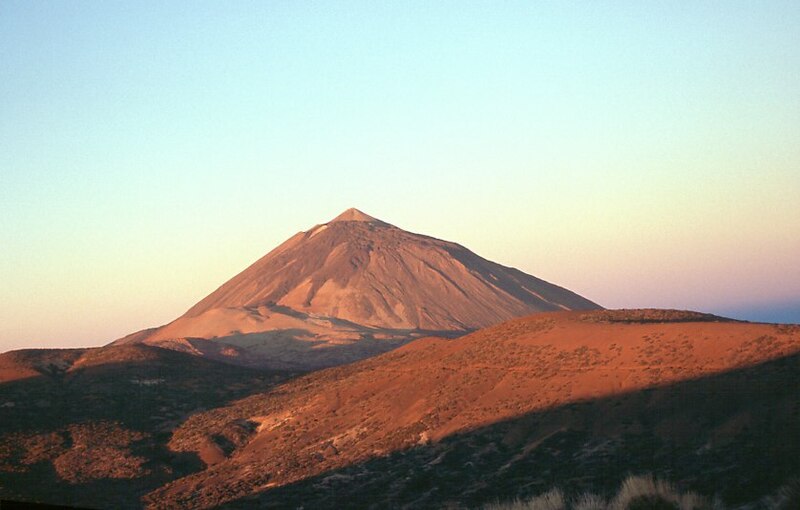 Tenerife is the main island of the Canary Islands, which are situated in the Atlantic Ocean a few hundred kilometers offshore the West African coast. 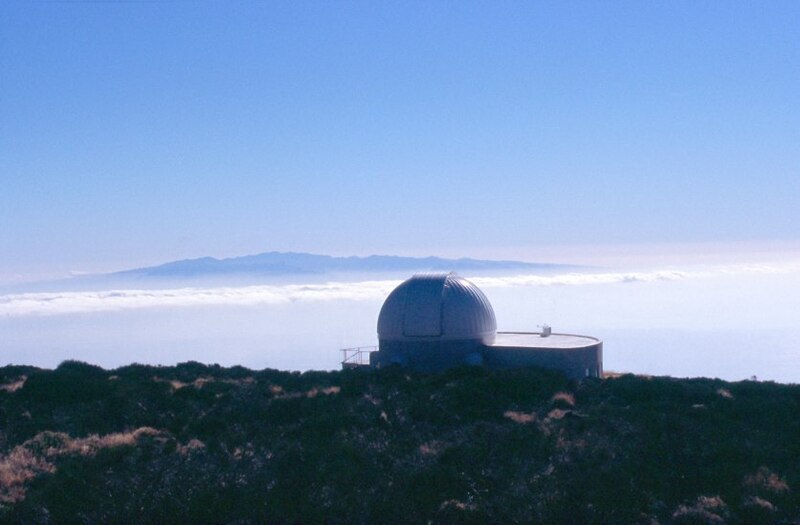 The observatory is maintained by the Instituto de Astrofísica de Canarias, IAC. 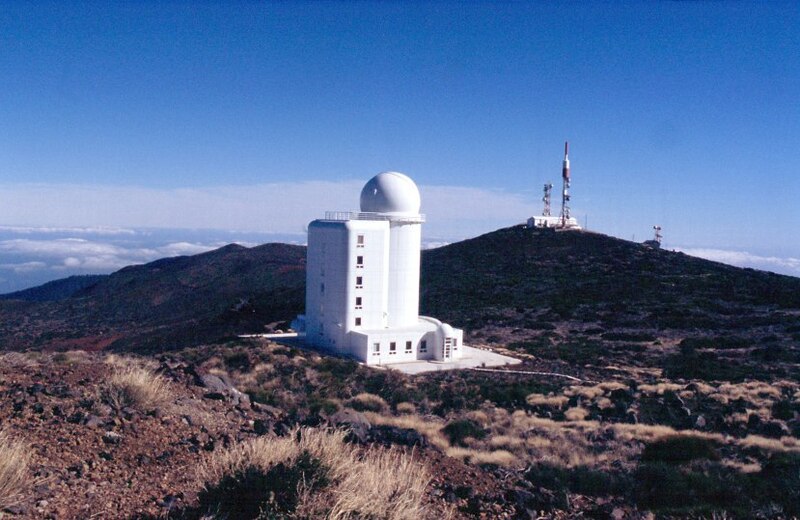 I had the pleasure to stay there for three observing runs at the 1.5m Telescopio Carlos Sánchez . (TCS) in 2001 and one more in 2002, taking infrared images of dwarf galaxies. 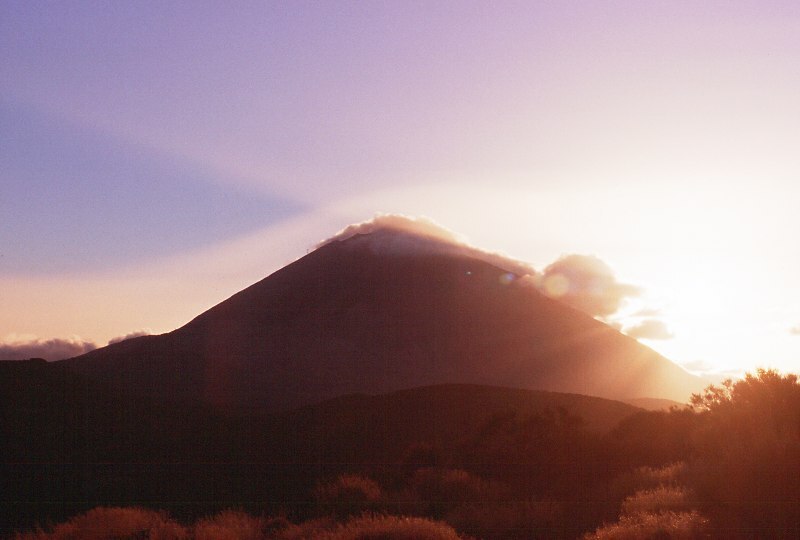 The OT is located 2400m above the sea on the main mountain ridge of the island, which is peaking at the vulcano Pico de Teide, altitude 3718m, Spain's highest mountain, 15 km west of the observatory. The landscape up there is a scanty, but beautiful. As seen from the observatory, the horizon is very low from southwest to east, and towards the northwest. In clear conditions the neighboring islands Gran Canaria and La Palma can be spotted from up there. At night, the sky is clear for the most part of the year, but tourism centers and towns down at the coast do add some stray light to the sky background if they are not covered by a layer of low clouds. 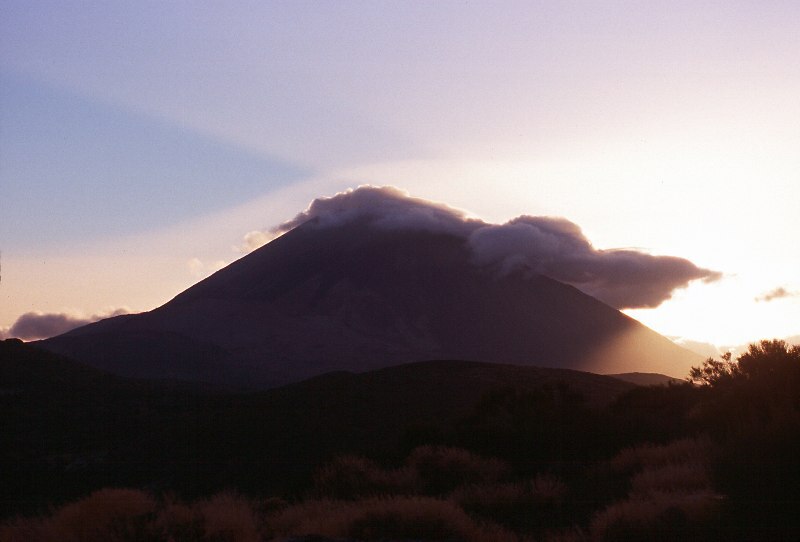 The 3718m high volcano, which is not active for the moment, does dominate the whole island. The photograph was taken in morning light from the Residenzia. There is a cable car going up the mountain from the left, but access to the very summit is not permitted. 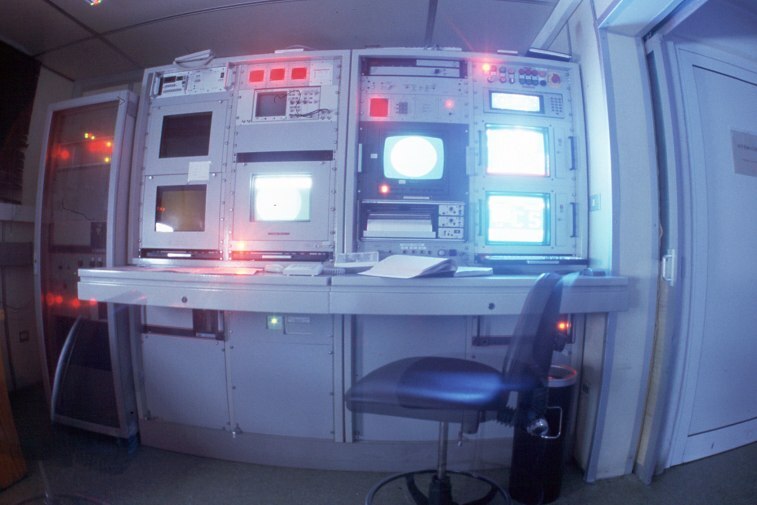 The Optical Ground Station (OGS), a 100 cm Schmidt Telescope operated by ESA. The French/Italian solar telescope is set a bit apart from the other facilities. In the background is the radio relay station at the top of the mountain Izaña, which is not part of the observatory. One of the two coelostat mirrors used atop the VTT to project the sun into the vacuum tube directly below. The telescope was not operating when I took this photograph. The small telescope at left is permanently locked on the sun during daylight and records H alpha images at regular intervals. 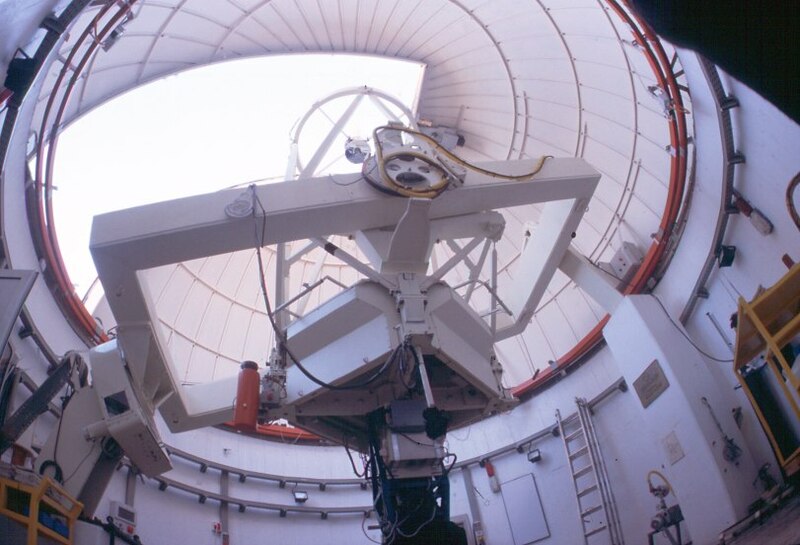 The IAC 80cm telescope. The photograph at left also shows the mountains of the island Gran Canaria in the background, which is 100 km distant. The sea is usually covered by a layer of clouds. 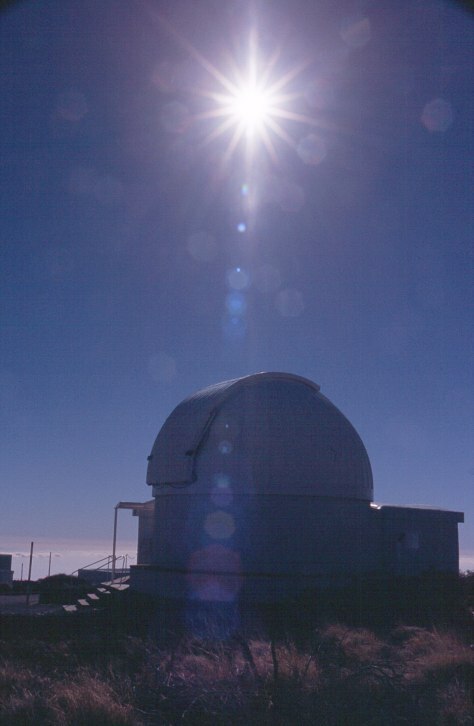 "My" telescope, the 1.5m Telescopio Carlos Sánchez, in sunlight. 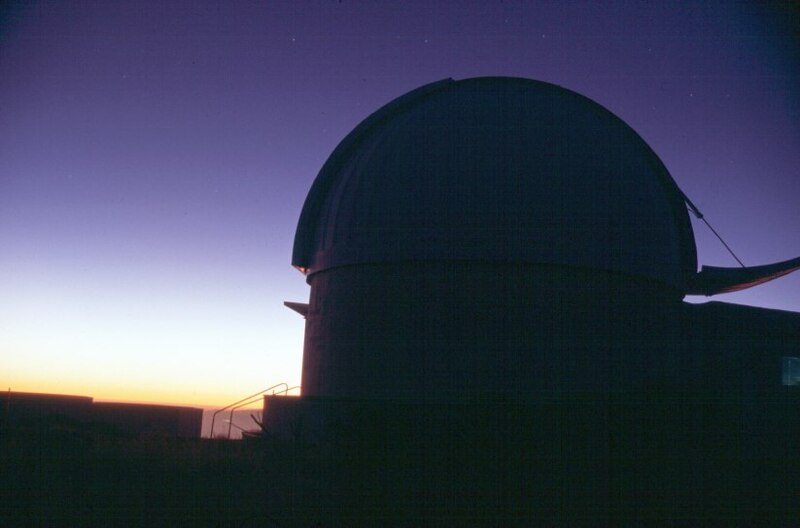 The dome of the Carlos Sánchez Telescope is being opened in evening twilight. 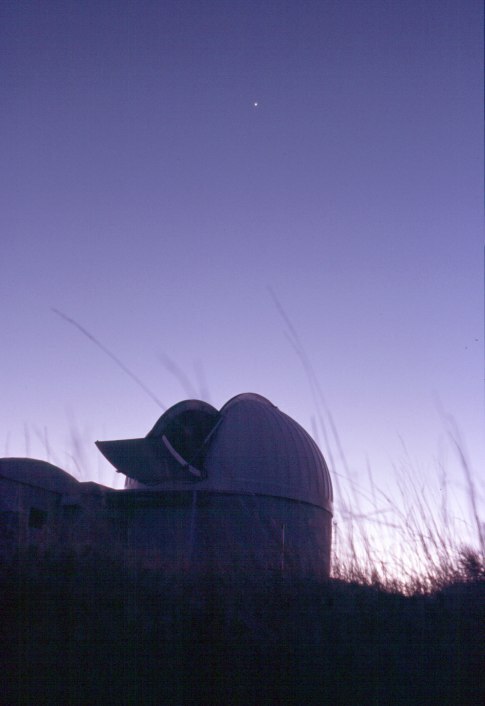 The bright "star" above the telescope in the right-hand photograph was Venus in January 2001. 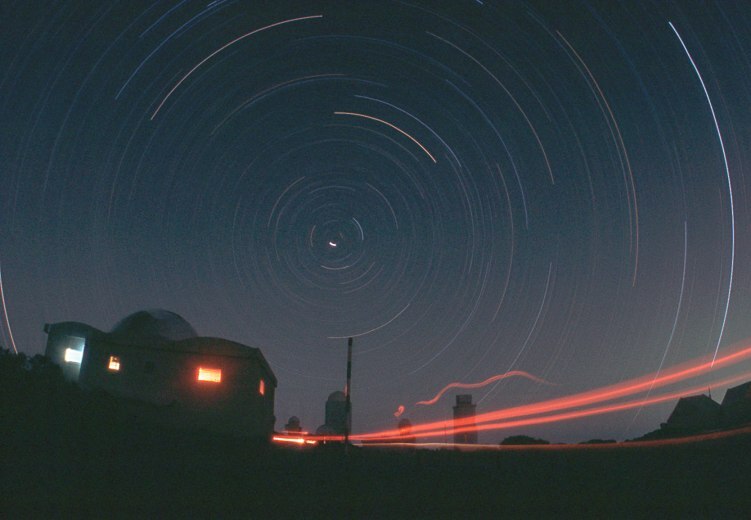 The left-hand photograph was taken with a fish-eye lens and shows the complete Carlos Sánchez Telescope resting in its English Cradle Mount inside the dome, pointing towards the zenith, in the "park" position. The right ascension axis is supported by the two pillars right and left with the motor being on the left (southern) side. 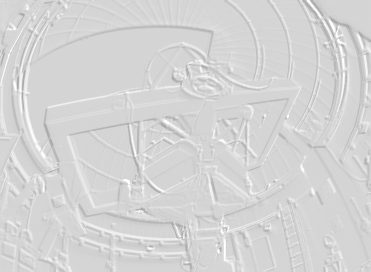 The declination axis is mounted in the middle of the longer side of the support rectangle. 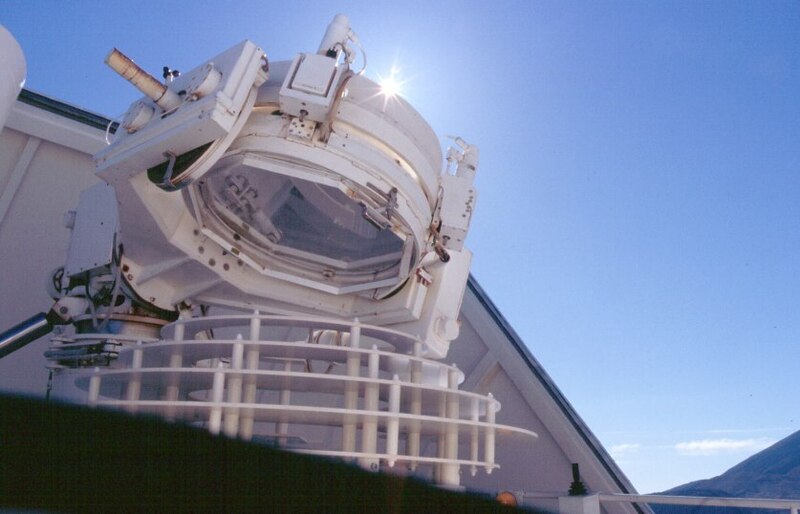 Light enters from above and is first reflected off the primary mirror, which rests inside the square mirror box, then off the secondary mirror on top, finally going through a hole in the primary to the instruments below the telescope. 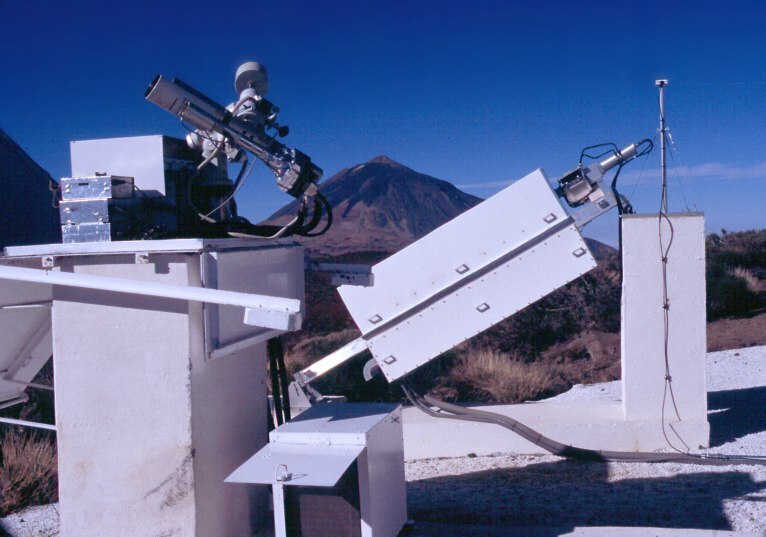 Click here for a Spanish description of the telescope. 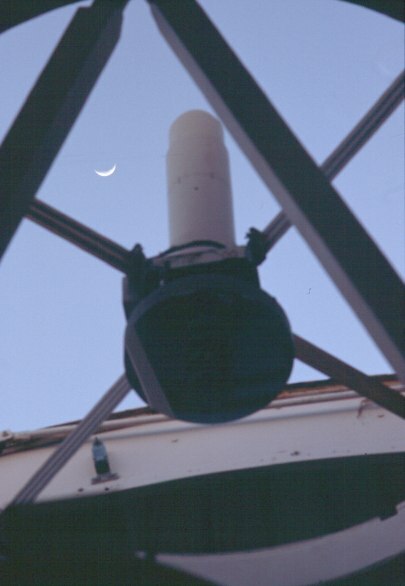 The secondary mirror can be seen close in the right-hand telelens photograph, together with the crescent moon. 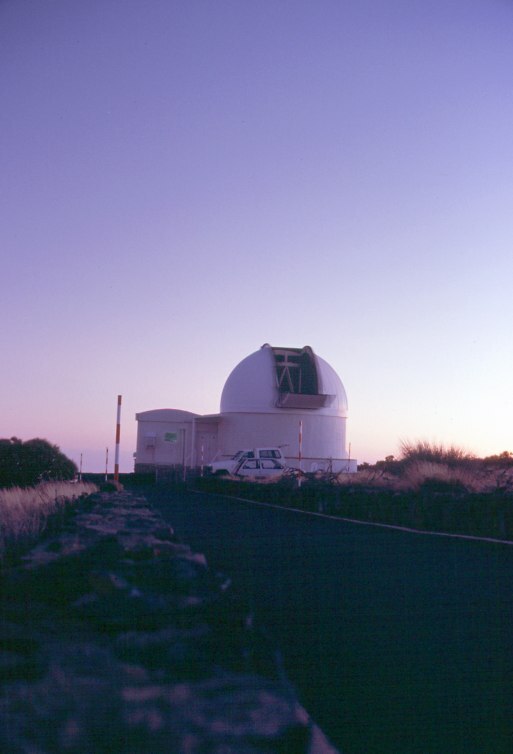 This photo was taken during twilight and shows the OGS telescope which was just having its dome opened. Stars are seen as trails in this 30min exposure. 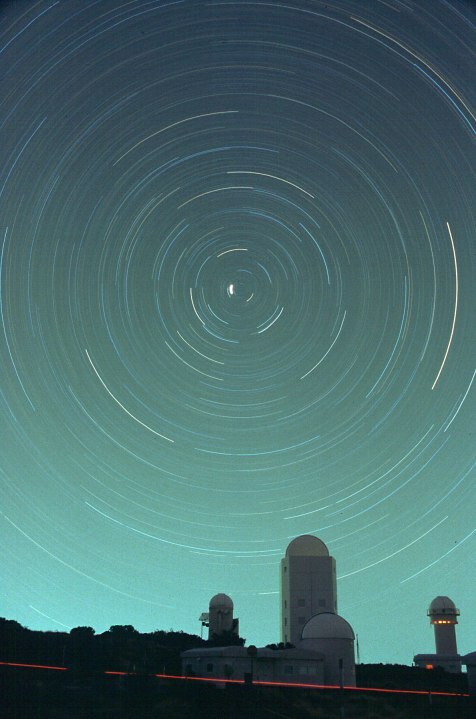 This 33 min exposure was taken with a fisheye lens pointing due north. The camera was set up just in front of the TCS dome, the flap of which can be seen towards the upper left. The telescopes in front were illuminated by setting the moon from the left side. As in all following pictures, the rotation of earth causes the stars to revolve around the celestial pole, thereby leaving circular "startrails" on the photograph. 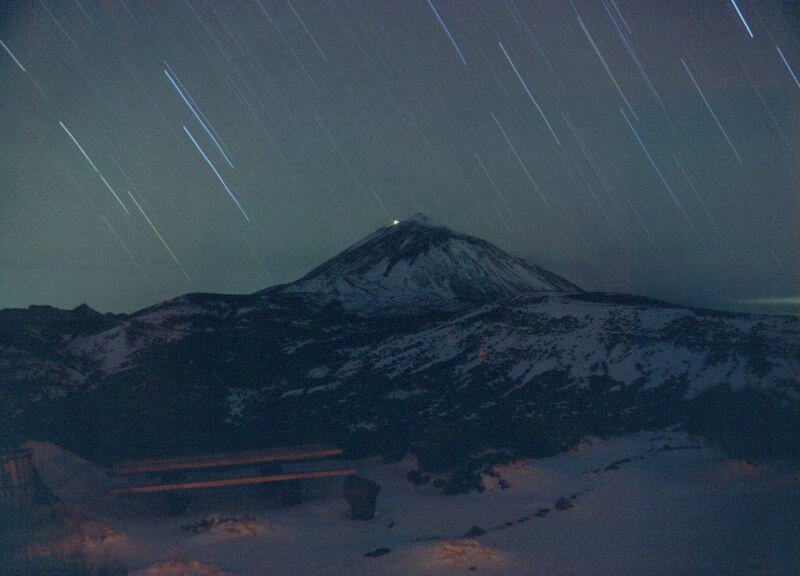 These hour-long exposed startrail photos were taken during various night in January and March 2001. The foreground telescope in the left-hand and right-hand photographs is the TCS. The camera pointed north in the left-hand and center photographs, and west in the right-hand one. 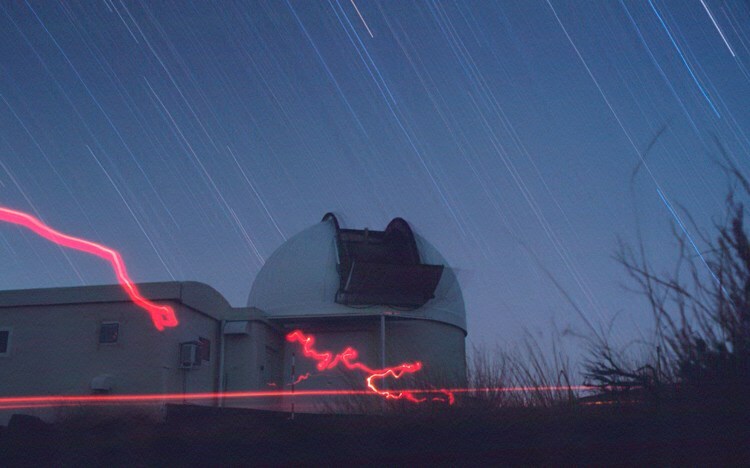 Straight red streaks originate from cars driving on the roads, wobbly red trails from hand-held flashlights. 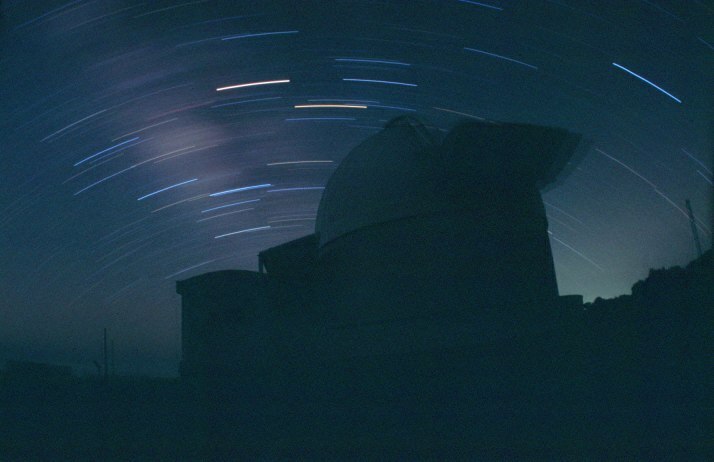 This photograph was taken in the first clear night after two days of snowstorm in April 2002. However, humidity was too high (close to 100%), and so that observation run was a complete loss. 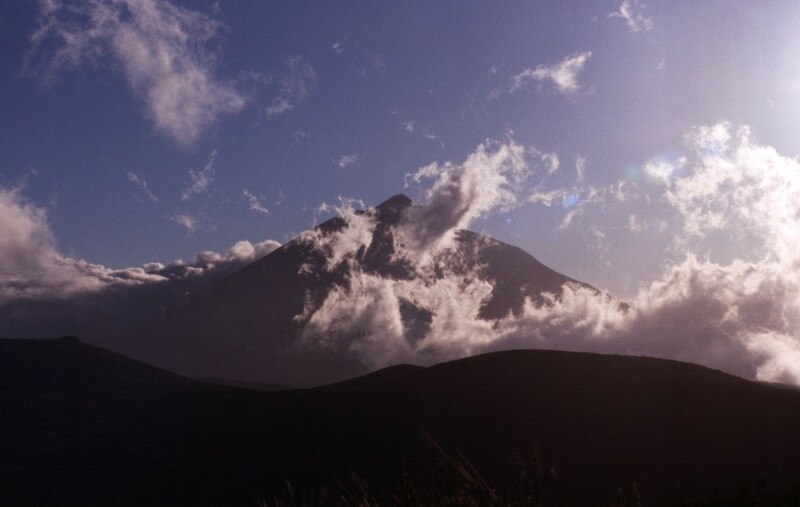 The light on the "shoulder" of the mountain originates from the upper station of the cablecar. A half-hour photograph taken trough a window of the Residenzia. To obtain this "wild" photograph I simply left the camera standing on a low tripod at the floor inside the dome, and pointed the fisheye lens up towards the telescope. The exposure ran for almost 5 hours. During that time, I was pointing the telescope at one single object and taking infrared exposures using various filters. 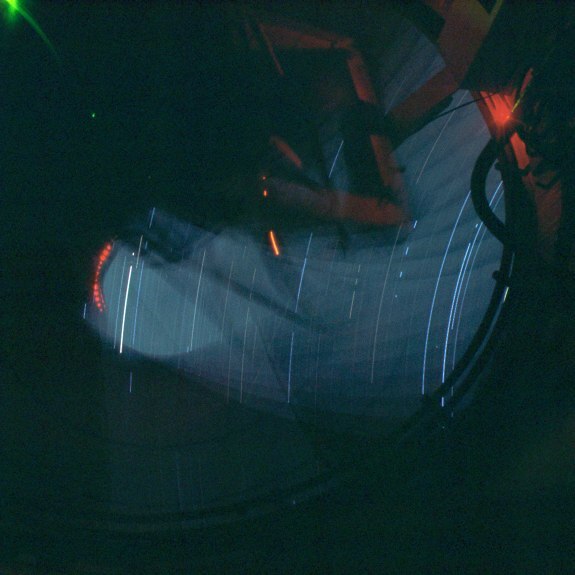 The telescope itself can hardly be seen due to its constant movement while countering the earth's rotation, but the dome slit can be spotted at various discrete positions as the dome moves only in steps while automatically following the pointing of the telescope. Stars seen through the opening left their trails on the photograph. Towards the end of March, the Summer Milky Way is already rising well above the horizon near the end of the night at Tenerife. 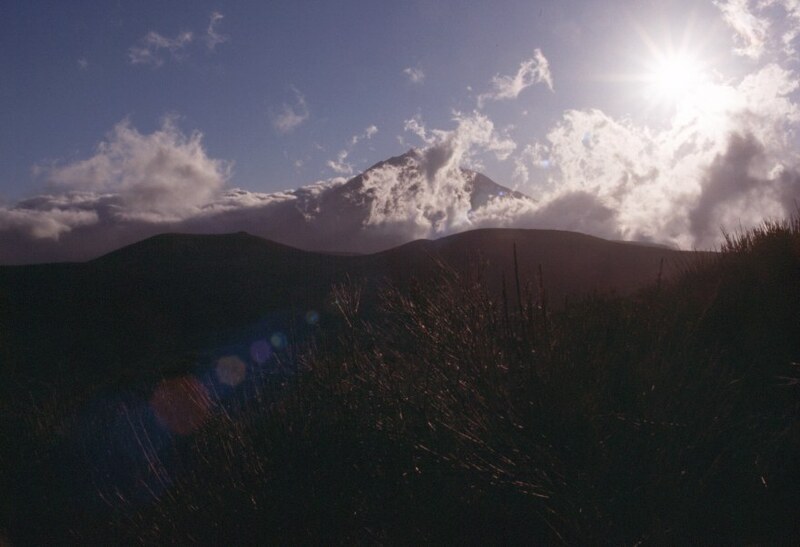 It can be seen as diffuse "cloud" in this 44 minute photograph. The planet Mars left the brightest trail, the others belong mainly to stars in Scorpius. 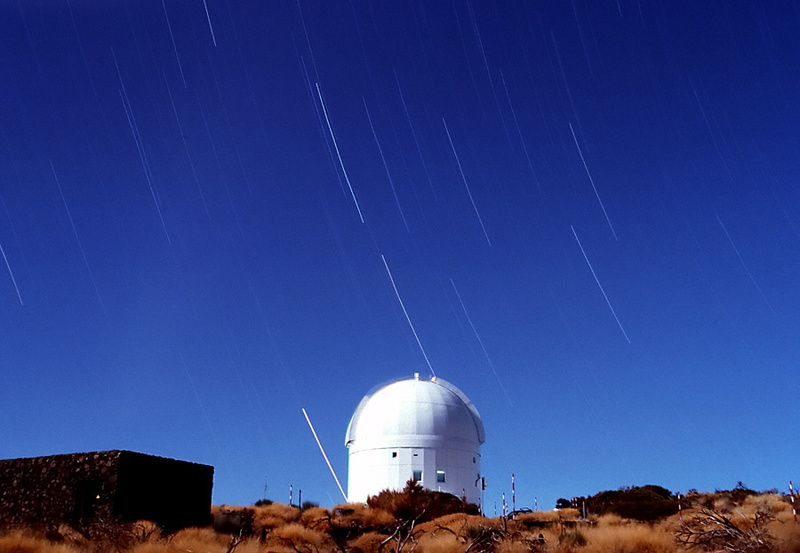 The telescope in the foreground is again the TCS; the dome rotated 2 steps during the exposure. Early morning twilight was already starting. 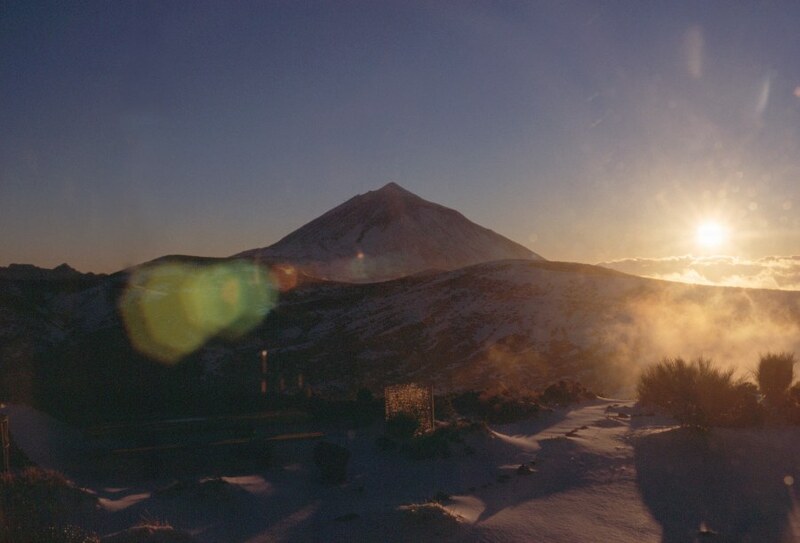 Dawn is breaking after a beautiful and full night of observations. 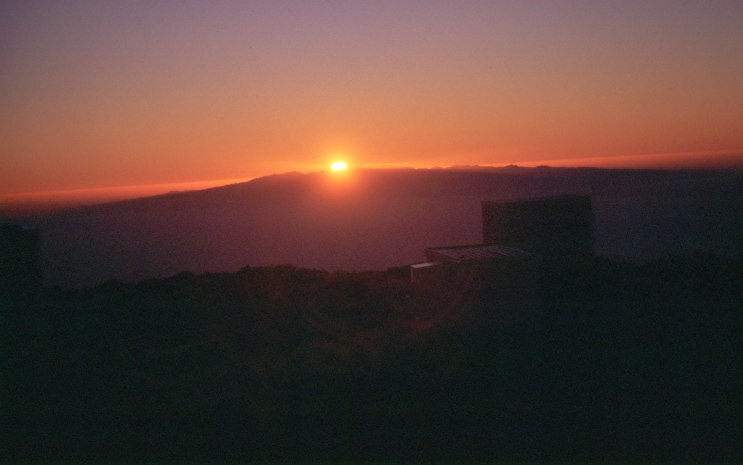 Seen from the observatory, the sun is rising exactly over the island of Gran Canaria in January. 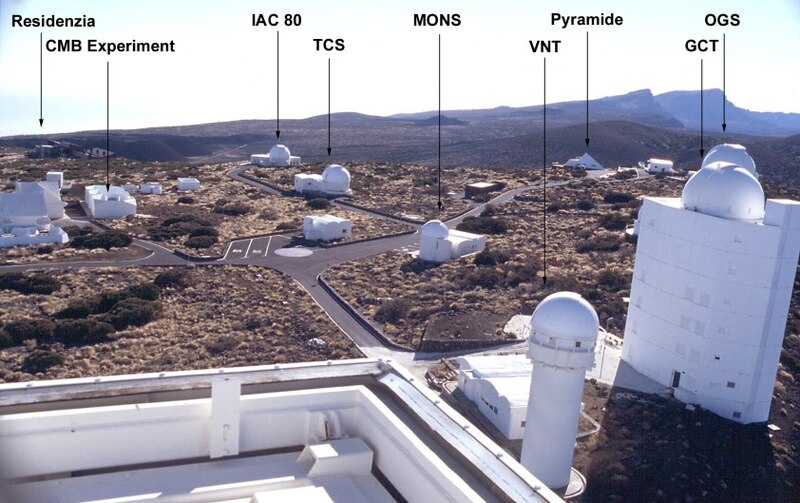 The buildings in the foreground belong to the Tenerife CMB Experiment. Time to think about bed for us astronomers! 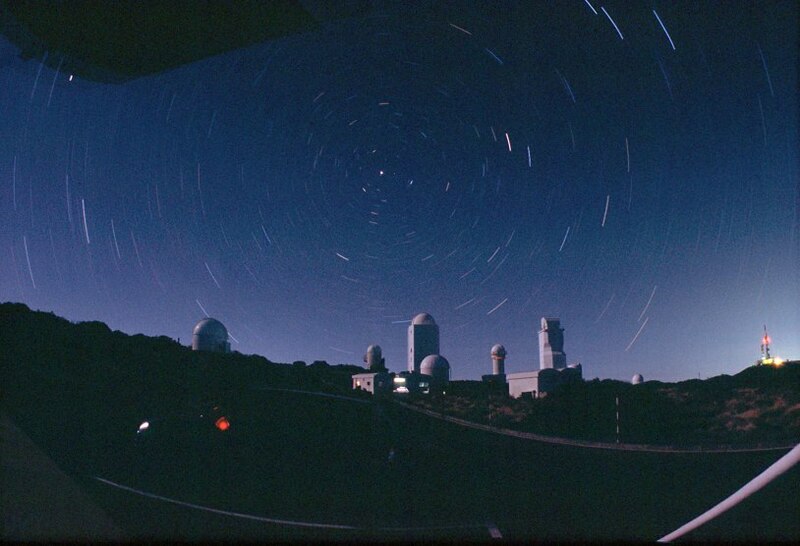 If you want to read more about my second stay at the observatory, when I made some visual deep-sky observations, and do understand German, you can read my Observation Report from March 28-31, 2001. All of the photographs and text on these pages are &COPY; Copyright 2006 by Walter Koprolin. All rights reserved. You may download these images and reports for your private use (e.g. as background pictures for Windows etc. ), but you must not publish these in any form, neither electronic nor on paper, without written permission of the author. Sorry about that, but long cold hours at the telescope and nearly as much time before the computer screen went into the creation of these images, and I just don't like to find my pictures published somewhere without my permission, as it already happened twice.